With all the precipitation we have been getting (and will continue to get for the foreseeable future) it is a good time to check out the lower elevation waterfalls in the Mount Shasta area. 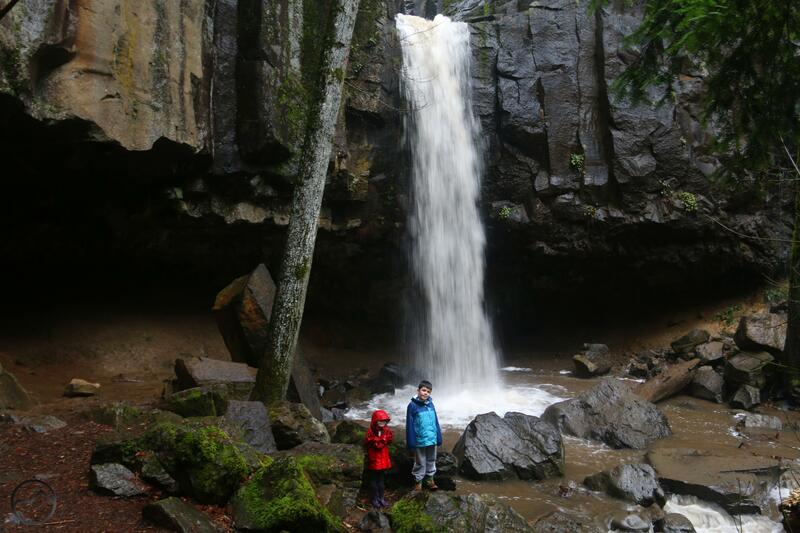 The easiest one to get to by far is Hedge Creek Falls in Dunsmuir. Right off the freeway but feeling a world away from the road, it is a great place to make a quick trip to check out how the weather has effected the flow. Today I picked my kids up from school, which is right on the way to the falls and within about 5 minutes we were pulling up to the trailhead. They hopped out and happily clambered down the trail to the waterfall. Hedge Creek Falls is not a really tall waterfall, nor is it typically pretty large. Yet, when the creek is swollen from passing storms or melting snow, if makes a fine, fine waterfall. The fact that the trail passes through the cave behind the waterfall makes it a particularly memorable cataract to experience. It has shades of the awesome Trail Of Ten Falls at Silver Falls State Park in Oregon. The large chunks of columnar basalt around the falls also adds a lot of visual appeal to the scene. Vista point view of the Sacramento River. 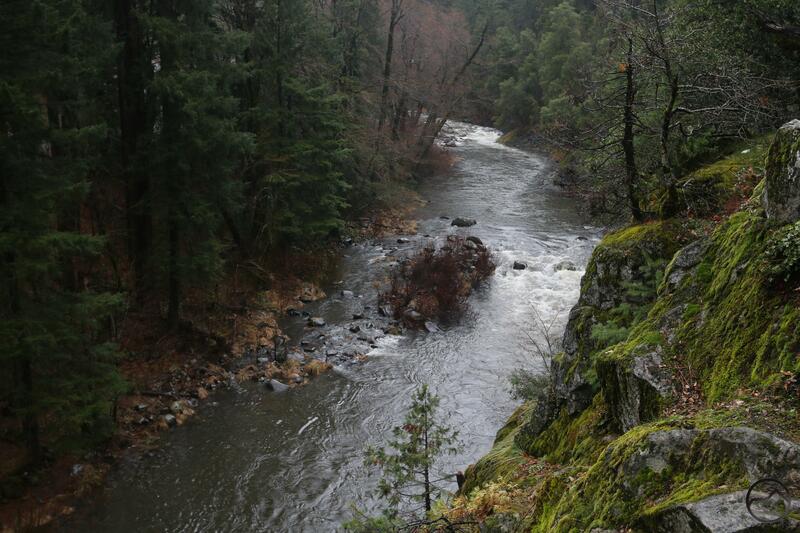 From Hedge Creek Falls, the trail continues downstream on the north side of the canyon. Normally this section of the creek is fairly sedate, despite dropping down some nice cataracts. Today, however, it was flowing with a good deal of fury and the normal little rapids and plunges were tumultuous storms slamming against rocks and racing toward the confluence with the Sacramento River. There was also a substantial cascade flowing down the south side of the canyon, adding to the din and is a real highlight of the conditions around Hedge Creek Falls. Though Mt. Shasta was lost to the clouds, the view of the Sacramento River was great and it too was running very full. The volume of water is likely to continue like this for some time, as the rain (or snow) will continue for over a week. Be sure to stop by Hedge Creek Falls at some point and see it with a strong flow! Good Morning, Hike Mt. Shasta! I’ve been receiving your emails and following your blog for quite some time. I’d very much like to share some of your pieces on MyOutdoorBuddy.com, a hunting, fishing and outdoor recreation site for California and Oregon. Maybe you are familiar with us. If you’re interested, please let me know! Your content would be awesome for our site. We don’t pay, but we would help you promote! I ‘d love to hear from you. Hi Sharon. I am sorry it has taken me a while to get back to you. How are you thinking of using the content from my site? Would it be repackaged or something or copy and pasted or just using link? Great picture and post. How do you get there from I5 north? I’d love to go later this month on our way from redding to mt shasta.